Here's a design for the guys - Dad, Grad or birthday boy - in Memory Box shades of Kraft, Copper, Lagoon, Slate and Licorice. Copper, Lagoon and Slate are from the Soiree Collection of rich, shimmery cardstock colors, perfect for a celebration. The Licorice Distressed Dots and Moroccan papers are from a collection of 8.5x11" prints in 14 great colors. I've manipulated some of the products a bit here - hope that's OK with Dave. Vintage Record Sheet (G1712) is turned on its side for a horizontal background. The rosette, cut and scored with the Blooming Rosette Die (98121) is created with the plain edge on the outside instead of the decorative edge - more like a wheel than a flower, for a guy-card. 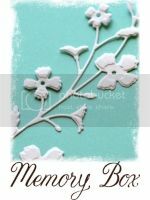 See the entire collection of Memory Box Dies here. Butterfly Orchard (more great dies!) was just released last week - just in time for summer cards and projects.